The winter weather in St. Louis with highs in the low 40s may make you feel like staying inside, but there are a lot of reasons to get outside during the cold winter months. Whether it's ice skating, sledding or even snowboarding and skiing, there are fun things to do during the winter days and nights in St. Louis. Grab your hats and mittens and take a spin at some the area's best outdoor places for ice skating. You can skate, get lessons, play stick and puck (hockey) at Steinberg Rink in Forest Park or Shaw Park Ice Rink in Clayton. Steinberg Skating Rink is one of the most popular outdoor ice rinks in St. Louis. Steinberg Rink in Forest Park is one of the largest outdoor rinks in the Midwest, and it offers beautiful views of the park while you skate. After a few spins around the ice, you can warm up with hot chocolate or a meal at the Snowflake Cafe. Steinberg is open from mid-November through February 28, 2019. The rink offers extended holiday hours, November 21-24 and Dec 21st - Jan 1, 2019, 10 a. m. - 11p.m. They are open Christmasmas Eve, Christmas Day, New Year's Eve and New Years Day. Shaw Park Ice Rink in Clayton is centrally located and easy to get to whether you are in the city or the county. The rink offers public skating sessions most days from the end of November through the end of February. The rink does close if warm weather causes unsafe ice conditions. Shaw offers stick and puck sessions for hockey players. Rink workers set up goals on the ice and allow players to practice their hockey skills. See their website for special holiday hours. When you want to go skiing or snowboarding, the Hidden Valley Ski Resort in Wildwood is really the best place to go. The resort has more than 30 acres of skiable terrain and more than a dozen trails from beginner to expert. Hidden Valley is most popular for its night skiing and midnight ski sessions on Fridays and Saturdays during the season. The slopes open each year in mid-December and close in February or March depending on the weather. There is a Kids Zone for young skiers and ski and snowboarding lessons for children and adults. For non-skiers, Hidden Valley has the Polar Plunge, a snow tubing hill for visitors of all ages. Sledding can be a great deal of fun when a good snowfall comes down in St. Louis. If you're going to go sledding, dress in waterproof gear to stay warm, and do not go alone. A few of the spots that are recommended for sledding are Art Hill in Forest Park, Blanchette Park, the dam at Lake St. Louis, Suson Park, and Bluebird Park. 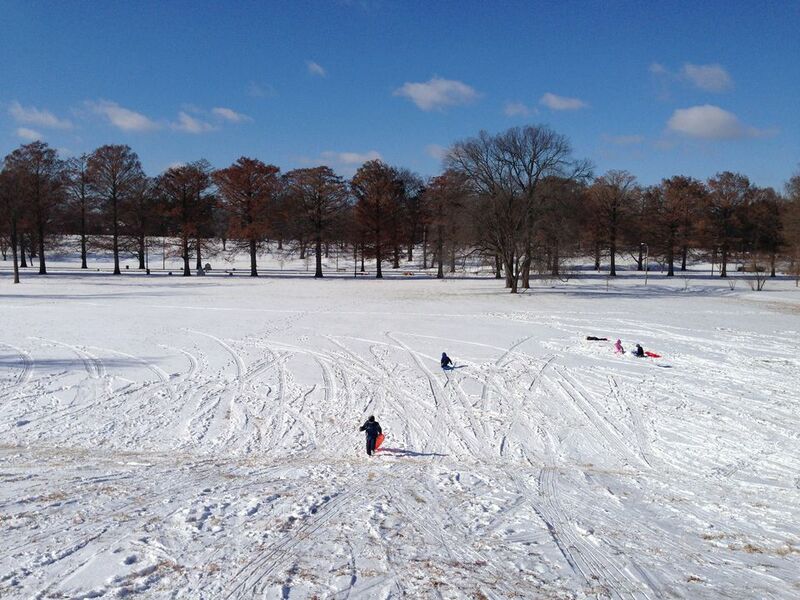 After a snowstorm, you'll find hundreds of kids and parents dragging their sleds and toboggans to Art Hill in Forest Park. The long wide hill stretching from the Art Museum to the Grand Basin is considered by many to be the best sledding hill in St. Louis, or at least the most famous. If you are in or near St. Charles, Blanchette Park is the place to go. It has several large open hills where sledders can take a ride on snowy days. For residents of western St. Charles County, or anyone that's looking for one of the steepest sledding hills in the area, it's hard to beat sledding down the backside of Lake St. Louise (the "little lake") at Lake St. Louis. It also bundles two winter activities together. If the lake's frozen solid, and the ice is smooth, you'll find kids and adults alike skating on the lake. The sledding hill at Suson Park in South St. Louis County is often crowded with sled riders of all ages. The hill is long with a nice but not too steep of a slope. Bluebird Park in Ellisville is another sledding hill for those who like speed. The hill is long and steep enough for a fast ride, but you do have to watch out for trees. Missouri's winter eagle watching is spectacular. Annually, the bald eagles build nests along the Mississippi River from late December through early February. Cross the river into Alton and Grafton, Illinois, or go 80 miles north of St. Louis to Clarksville, Missouri, to look for eagles perched in large trees along the water’s edge. Get out early in the morning to see the eagles flying and fishing. Along the Great River Road in Alton and Grafton, you'll find one of the largest populations of bald eagles in the United States. Hundreds (and sometimes thousands) of bald eagles return every winter to build nests along the Mississippi River. You can see them as you drive along or attend one of the many bald eagle events for a closer look. The small and otherwise sleepy town of Clarksville attracts thousands of visitors during the winter. Its location on the Mississippi River makes it a prime spot for eagle watching. The Clarksville Visitors Center offers binoculars and spotting scopes for public use. While there, check out the Clarksville business district, which is filled with unique shops and restaurants.